Good News at the Right Time of Year: Home Values, Equity and Excitement are UP! In Many Markets, Home Prices Near 2006 Peak! The holiday season is right around the corner, and the housing market could not provide homeowners with better news! Over the past year, the housing market improved by leaps and bounds. Several factors, such as fewer distressed properties, low inventory, and high demand converged to drive up home prices and give equity back to homeowners who haven’t had equity since the housing bubble burst. As more homeowners regain equity, homeowners who have been waiting to sell their homes are finally finding themselves in a position to do so. 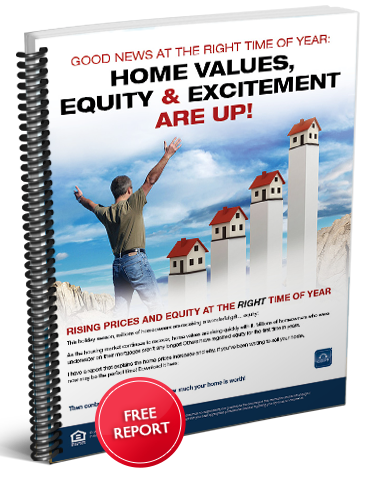 I have a report entitled “Good News at the Right Time of Year: Home Values, Equity and Excitement are UP!” that explains why prices keep rising and how it affects you. If you’ve been waiting to sell your home, it’s important to know that your situation may have changed. You can download the report from my website. After reading the report, contact me today to discover what your home is worth now.